Qamishli (Syria) (AFP) - The top US military commander for the Middle East made a secret trip to northern Syria on Friday to meet a US-backed alliance fighting the Islamic State group, officials said. The trip, unannounced for security reasons, was first such visit under the new US administration, but the third in a series of meetings with the SDF. SDF spokesman Talal Sello told AFP that Votel "discussed the increase of coordination and support (to the SDF) in the era of Donald Trump". "There were promises of heavy weapons in future stages," Sello said. However, Votel's spokesman Colonel John Thomas stressed that the general did not make any specific promises about any type of weaponry. 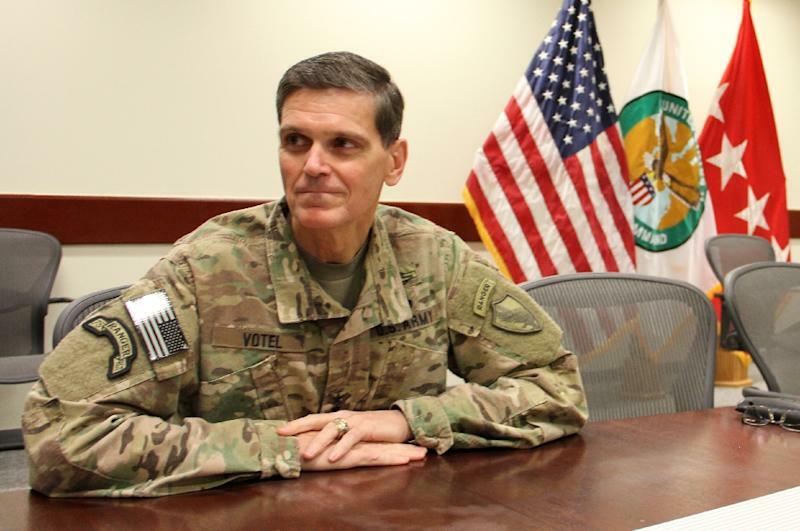 "During the conversation, General Votel understood their need for logistical support and resources that may be greater than what they have been provided up until now," Thomas said. "While assuring them that this was a need he understands, he did not make specific promises." In an online statement, Sello said Votel had met with several SDF commanders. "The results were positive. We discussed the developments in the Euphrates Rage campaign and shared military matters," Sello said. He described the meeting as "confirmation of US support for our forces". An SDF source told AFP the visit lasted four hours. According to a senior source in the SDF, "Votel confirmed the coalition's commitment to protecting Manbij from any attacks waged by Turkey or supported by it, as part of its previous commitment to protecting the area." Manbij is a city in Aleppo province. "We did not discuss opening corridors for Turkish-backed forces to enter areas under our control," the source said. But Thomas said that, while Votel supports a peaceful transition of Manbij to a "thriving city", he did not say if the United States would stop any supposed Turkish move towards it. Votel "understands that open communication on all sides is the best way to prevent any unfortunate change in the progress that Manbij has made", Thomas said. Founded in October 2015, the SDF is an alliance of Kurdish and Arab fighters that has seized swathes of territory from IS across northern Syria. The United States has special operations forces advising the SDF on the ground in Syria, but no combat units. On Wednesday, Votel told journalists travelling with him in the Middle East that more US troops might be needed in Syria, although he stressed local forces would be the primary force. "I am very concerned about maintaining momentum," Votel said, in comments reported by the New York Times and other outlets. "It could be that we take on a larger burden ourselves."